Event sponsorship is an important aspect of many business events. It is a great way to build new relationships, enhance brand awareness, and attract new customers. (Tweet this!) Having the support of a well-known and respected company will not only be great PR for your business but will also gain the trust of potential consumers. In order to attain the ideal event sponsor, check out the suggestions below. Before you begin contacting sponsors, think about the type of company with whom you want to align your business. Think about your brand, what it represents, and who your target audience is – the answers should help narrow down the type of sponsor you need, as they should share these same targets. Knowing your audience is an important factor to attract potential sponsors. Companies want to know how sponsoring an event will benefit them, and the type of brand exposure your event can offer. When planning an event, identify all the ways a sponsor could benefit from your event. Think about where you could place their logo, if they would benefit from showing their products at a booth, or any other way they could market themselves at the event. By identifying the best opportunities for a potential sponsor, you are able to be clear about why a particular company would benefit from participating in your event. Depending on the time-frame of your event, there are different ways to go about contacting sponsors. If you begin contacting them months in advance, you should start off with an email introducing your business and the event. These emails should not be used for a pitch, instead, they should be used as a conversation starter. Before you send your emails, however, do some research about your potential sponsors. Understand what their brands are, what they hope to accomplish, and who their audience is. Look at their website, social media, and advertising to see what they’ve accomplished and if they’ve sponsored events before. Based on this information, tailor your email message to each sponsor. Remember to include how your event will benefit your sponsor and the type of audience they could reach. Make sure the email is all about them, and emphasize how you intend to add value to their company. When speaking with potential sponsors that have shown an interest in sponsoring your event, make sure to follow up and send them detailed marketing materials that promote the benefits of sponsorship. This should be used as part of your event strategy to help give your prospect all necessary information. When doing a phone campaign your initial pitch should be no longer than 30 seconds and should explain the event, audience and the ways the sponsor can benefit. Once they show interest, include more details in order to have a more robust conversation. 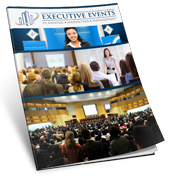 Executive Events is happy to assist with any other sponsorship questions or to help plan your next event. For more information, contact us at info@assistmyevent.com or call 757-785-5081.